American solar satellite. Magnetic field data. Research satellite built by NASA, Goddard Space Flight Center for NASA, USA. Launched 1961. Status: Operational 1961. First Launch: 1961-02-25. Last Launch: 1961-05-24. Number: 3 . Gross mass: 34 kg (74 lb). 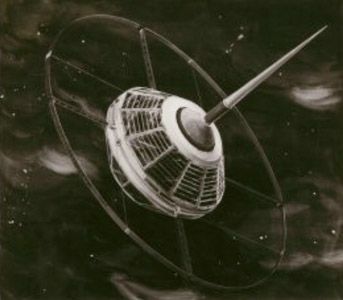 Explorer 10 was a cylindrical, battery-powered spacecraft instrumented with two fluxgate magnetometers and one rubidium vapor magnetometer extending from the main spacecraft body, and a Faraday cup plasma probe. The mission objective was to investigate the magnetic fields and plasma as the spacecraft passed through the earth's magnetosphere and into cislunar space. The satellite was launched into a highly elliptical orbit. It was spin stabilized with a spin period of 0.548 s. The direction of its spin vector was 71 deg right ascension and minus 15 deg declination. Because of the limited lifetime of the spacecraft batteries, the only useful data were transmitted in real time for 52 h on the ascending portion of the first orbit. The distance from the earth when the last bit of useful information was transmitted was 42.3 earth radii, and the local time at this point was 2200 h. All transmission ceased several hours later. Family: Astronomy, High earth orbit, Solar. Country: USA. Launch Vehicles: Jupiter IRBM, Thor, Delta, Juno II, Thor Delta. Projects: Explorer. Launch Sites: Cape Canaveral, Cape Canaveral LC17A, Cape Canaveral LC26B. Agency: NASA. Bibliography: 126, 2, 6, 6767, 12940. 1961 February 25 - . 00:13 GMT - . Launch Site: Cape Canaveral. Launch Complex: Cape Canaveral LC26B. LV Family: Jupiter. Launch Vehicle: Juno II. FAILURE: Third Stage failed to ignite.. Failed Stage: 3. Explorer - . Payload: S-45. Mass: 34 kg (74 lb). Nation: USA. Agency: NASA. Program: Explorer. Class: Astronomy. Type: Solar satellite. Spacecraft Bus: P. Spacecraft: P-14. Decay Date: 1961-02-24 . 1961 March 25 - . 15:17 GMT - . Launch Site: Cape Canaveral. Launch Complex: Cape Canaveral LC17A. LV Family: Thor. Launch Vehicle: Thor Delta. Explorer 10 - . Payload: P-14. Mass: 35 kg (77 lb). Nation: USA. Agency: NASA. Program: Explorer. Class: Astronomy. Type: Solar satellite. Spacecraft Bus: P. Spacecraft: P-14. Decay Date: 1961-06-30 . USAF Sat Cat: 98 . COSPAR: 1961-Kappa-1. Apogee: 181,100 km (112,500 mi). Perigee: 221 km (137 mi). Inclination: 33.00 deg. Period: 5,013.90 min. Magnetic field data. 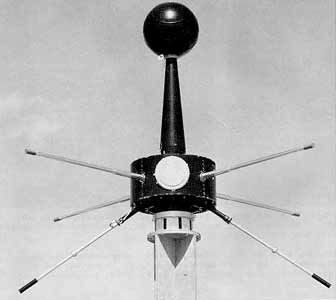 Decay date suspect Spacecraft engaged in research and exploration of the upper atmosphere or outer space (US Cat B)..
1961 May 24 - . 19:48 GMT - . Launch Site: Cape Canaveral. Launch Complex: Cape Canaveral LC26B. LV Family: Jupiter. Launch Vehicle: Juno II. FAILURE: Second Stage failed to ignite.. Failed Stage: 2. Explorer S-45A - . Payload: S-45A. Mass: 33 kg (72 lb). Nation: USA. Agency: NASA. Program: Explorer. Class: Astronomy. Type: Solar satellite. Spacecraft Bus: P. Spacecraft: P-14. Decay Date: 1961-05-24 .